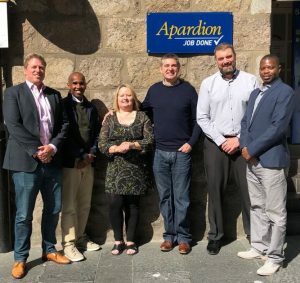 The FRG Senior Management team, Jamal Tahlil, Edgar Chibaka and Simon Alderson, with former Apardion owners John and Helga Macfarlane and new MD Derek Nielson. Leading UK Security, Risk Management and FM Providers First Response Group (‘FRG’) has acquired Aberdeen based Apardion Ltd to expand its national capabilities in the corporate security sector. Founded in 2007, FRG provides Integrated Security, Labour Supply and Total FM solutions to private and public-sector clients nationwide. The acquisition of Apardion forms part of a 10-year strategic business plan and follows the recent acquisition of Robinsons M & E in May to create a £25m+ turnover group. Simon Alderson, CEO of FRG said: ‘The acquisition of Apardion Ltd extends our corporate and keyholding response services in Scotland and is a significant component of our business growth strategy which aims to deliver true national coverage across the UK. Apardion’s experience and reputation for providing professional, reliable and customer focused services made it a natural fit for our expanding FRG group portfolio. We are excited to continue the Apardion story through support and investment’. Apardion was established in 1998 and is Aberdeen’s leading Security & Facilities Management company, currently employing 40 staff. Located in the heart of the city, the business offers a range of bespoke security and FM services, including manned guarding and mobile patrols, to customers in corporate, construction site and event environments. Apardion is the old Norse word for Aberdeen and the company will continue to trade under this name to retain its Scottish identity and heritage. Derek Neilson former Apardion Operations Manager, has been appointed as Managing Director with immediate effect. Derek commented: ‘FRG’s acquisition of Apardion provides an exciting opportunity for our business to expand across Scotland with the backing and stability of one of the UK’s leading multi-service providers. Company growth will provide job protection and create career development opportunities for our staff, while our clients will benefit from the introduction of new services and innovation. FRG’s culture of inclusion and happiness values the importance of Apardion’s Scottish heritage and we are delighted to be working with them to pursue excellence on a national level’.